One of the biggest advantages of being a consultant is that you will be able to play with new technologies/functionalities because each customer comes up with their unique requirements. This is how I was introduced to Salesforce's Financial Services Cloud (also known as FSC) recently. Today I am going to explain basics of FSC and how you can start exploring it. Salesforce's Financial Services Cloud is basically having the similar concept of Non-Profit starter pack. It will be a combination of managed and unmanaged packages installed to your org. Focus here is to support Financial Services sector. FSC is only available in Lightning Experience. 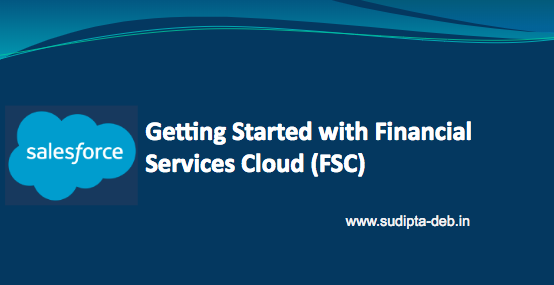 The heart of FSC is the managed package - "Financial Services Cloud". Along with this, you will get two more unmanaged packages - "Financial Services Ext" and "Financial Services Referral Ext". There is another very important managed package which will be kind of differentiator and that is none other than "Financial Services Cloud - Einstein Analytics". Note - This is true as of today (Winter 18 release). FSC will allow companies like wealth management, investment firms, banks, asset managements and other financial institutions to manage their customers, along with their assets, liabilities, financial accounts, and much more. With this high level description why FSC, let's dig into more unique terminologies now. 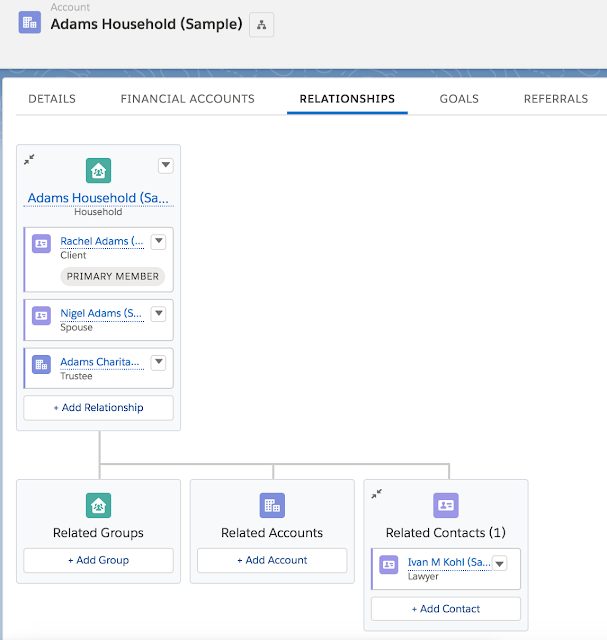 Let's start with Financial Services Cloud's building blocks - Clients and Relationship Groups/Households. Clients - A client is anyone doing business with the advisor in the past, present or future. Clients include prospects, active or inactive clients, spouses, partners, and dependents. FSC implements clients in two different ways Individual or Person accounts. Don't worry, I am going to explain the differences between them very soon. Relationship Groups/Households - A household represents a groups of clients and businesses whose financials are summarized at the group level. In FSC, each client or entity's role(s) within that household is tracked. With that financial for each client or entity who are part of the same household can be rolled up to the group level for an aggregate view. 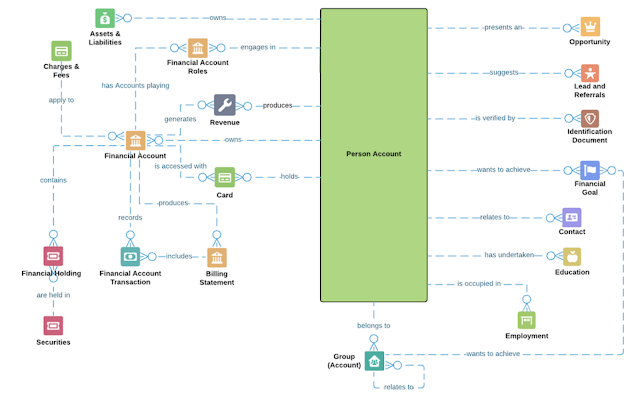 Now Financial Services Cloud's data model is basically having two versions based on your org's requirement of managing individual accounts or person accounts. Individual Model - This model uses the combination of standard Account and Contact object to represent a unified view of the customer. In this model you should use Individual record type if the client is person, otherwise use Institutional record type when the client is business of institute. Person Account Model - This model uses standard Account object to hold all the information about a person. In this model you should use Person record type if the client is person, otherwise use Institutional record type when the client is business of institute. Individual - This represents a person client. For example, if you are client of a financial planner or advisor or customer of a bank, then you are represented as Individual account. Institution - This account record type represents business client. For example your employer. 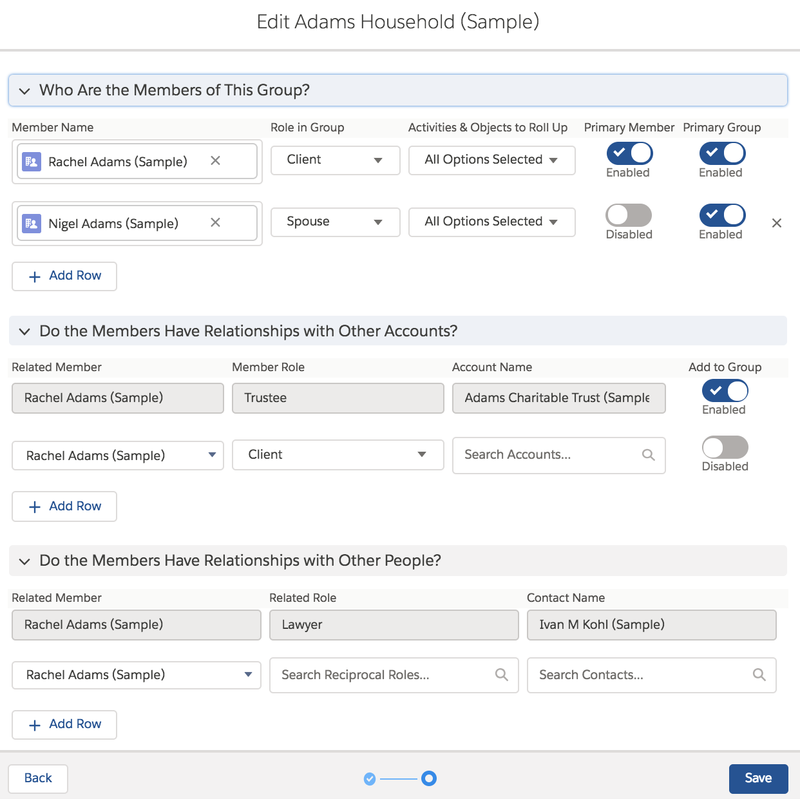 Household - This record type is used to group multiple individual accounts under one roof. This is used to roll up their aggregated financial information at the group level. Consider this as your household where you have you, your wife, children all are individual accounts. Business - This is the standard salesforce account record type. 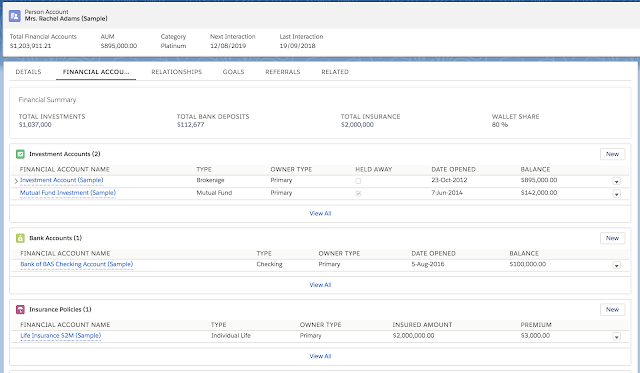 Financial Accounts tab under Individual or Institution record will show all the assets, accounts owned by the client. 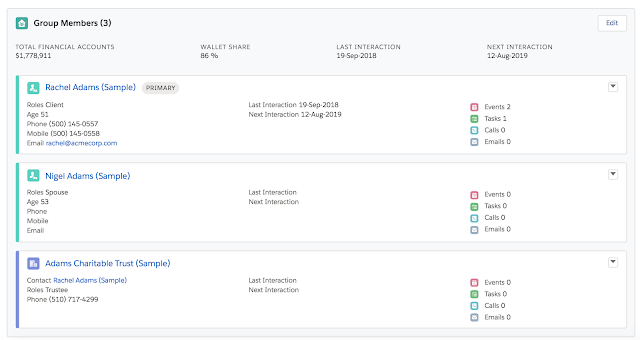 Financial Summary at the beginning of the page will show roll up data of all the information in the Financial Account related list. It provides a quick overview of the client's financial picture. In Financial Industry, relationship is the key. It is very important to track every type of relationship between clients, non-clients. The Relationship tab will help advisors to understand how the clients and non-clients are related to each other. As you see from the above picture, Rachel Adams is part of Adams Household as the Primary Member. Nigel Adams (Spouse) and Adams Charitable Trust (Trustee) is also part of the same household. At the same time Ivan M Kohl is also related to Adams Household as their lawyer. There is rollup section below which is a snapshot of the household members and their relevant informations. So in a single snapshot, I can see relevant contact details, their last and next interaction. That's a lot of backend processing. Thinking of how to do that. You know it's very easy. 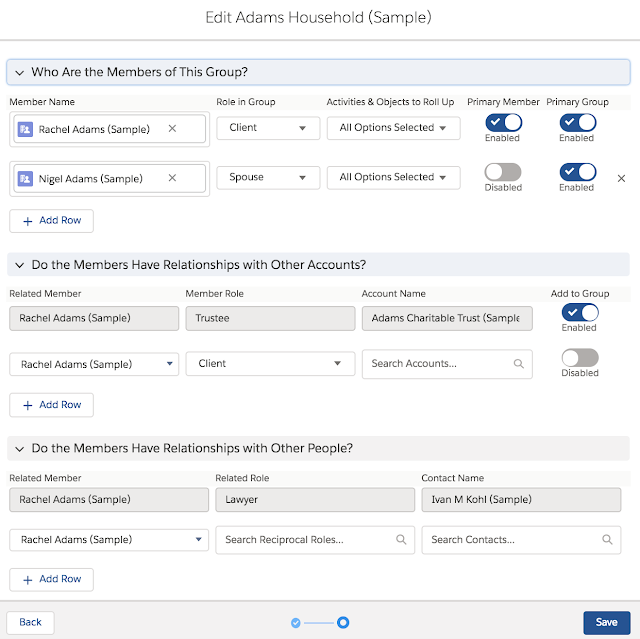 Clicking on +Add Relationship button will bring the below page where you can configure what to add, configure them as primary member/primary group, their role in this relationship, values to be considered during roll up etc. 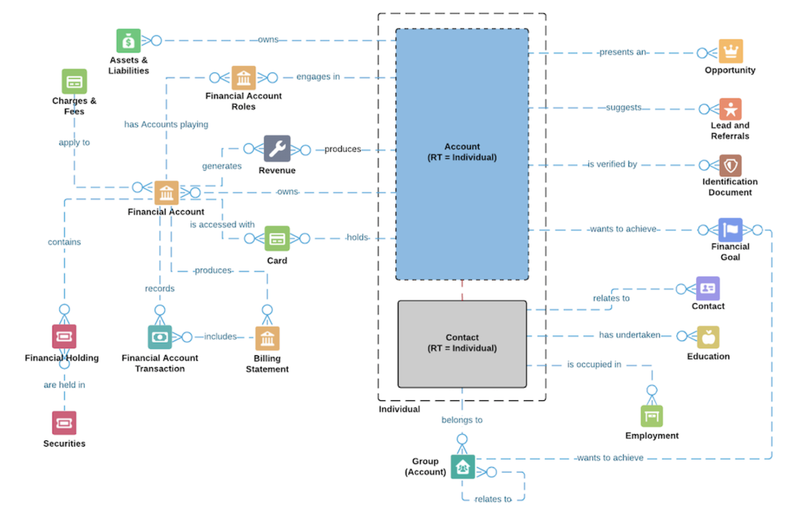 As FSC adds some extra complexity to the data model, so it is very important to understand the data model first before start migrating data into Salesforce FSC. Like for Individual records, one should create either Account or Contact record, but not both, otherwise it will create duplicate records. Special thanks to our speaker, Shruti Sridharan, for sharing her knowledge on Einstein Bots.